Widows Don't Wear Black – Nor do we have two heads or carry leprosy. We walk among you unnoticed until normal little everyday things force us to fall apart in public and reveal ourselves. This is my place to vent my frustrations, wallow when I need to and discover a new future because the unthinkable did happen and my husband died suddenly at 38 leaving me and our two little babies under the age of two behind. It’s funny how holding onto things has given me comfort over six years. I recently packed up our lives, put everything in boxes and moved. For happier times already, really good times and so beyond where I thought we could ever be. In the process though I noted how many things of colin, of our old life, have been simply around us as we moved forwards over the past six years. These have been a comfort. If the girls say ‘I need something of Daddy’s to help me go to sleep’ they’ve been on hand – photos, T-shirts, sweaters, coats, panda – they were all hanging there in my closet and in or on my bedside table. I’d done my research. I didn’t need to be told. Those things were good for my girls to have on standby for them to connect with a dad they couldn’t remember. I packed them meticulously so that in our new life they would still be at arms length for those ‘moments’. But what I hadn’t addressed was me. I haven’t written a post here for so long. I’m happy. I’m happier than I’ve been in so long it’s not something I can put in words. I’ve held onto dates. I’ve held onto friends. I’ve held onto his driver’s licence and his passport and travelled with them every time abroad. But most of all, it seems today, I’ve held onto the car he most likely had his last moments in. We had a car. It was small and old. A Volkswagon Golf. Colin, Evie and I fitted it ok. But when I was pregnant again with the bump that became Isla we thought of the future. When we bought our new family car in December 2011 it was our future. Little did we know when we signed all the paperwork that in 13 weeks Col would die, most likely last moments at the wheel of that car. I’ve adored that car. I’ve told so many stories to the girls about daddy and that beast of a Nissan. I’ve held the driving wheel on bad days and thought his hands held here for those last moments…. so I am close to you/him. I loved the silliness of us. I loved the lovingness of us. I loved being in our team. I do not always love flying solo in parentdom. I wish our team had had longer to do all the things I now do alone but with two kids. From bike riding to sofa slobbing, from breakfast to bedtime, there always seems to be those nanoseconds within the daily rollercoaster ride of happiness highs and parenting lows where I just feel super alone and that Colin-shaped hole looms over us. It’s not even a ‘poor me’ moment or nostalgia for our time back, in our past, its just me acknowledging that deep nag that sits within me that grieves in glimpses, in tiny moments in time, for what he’s missing now and in the years to come as well as feeling sad for what the three of us have also lost in our present and future. In those tiny moments I wish there could be a glimpse in that Mirror of Erised from Harry Potter but I fear I would get lost in it. And it would only make me sad again and I don’t have time. Five years. Half a decade. 1,828 days. 157,939,200 seconds. 2,632,320 minutes 43,872 hours. 261 weeks. Whatever unit of time I use it feels too bloody long since I distractedly said goodbye to my husband as he left the house in a flurry to go and play tennis. How can I have survived the half decade that I have since Colin’s heart stopped working at 3.01 on a south London road on Saturday 25th February 2012. When I saw that policeman’s uniform through the windows of my front door I didn’t think I could live a minute without him let alone five whole years. The 25th of February 2012 is the day that my whole life changed completely and forever and somehow this year feels worse than year one, two, three or four. The world has spun me so very far away from him now and the pain may has multiplied with every eon. And now sometimes he feels like a figment of my imagination. This time of year is always so rubbish in terms of trying not to feel the countdown between the day Isla was born (Christmas Eve 2011) and the day Col died (25th February 2012). Just nine short weeks and every year I feel them ticking. So this year I am sorting so many positive and proactive things to try to avoid the spiral. 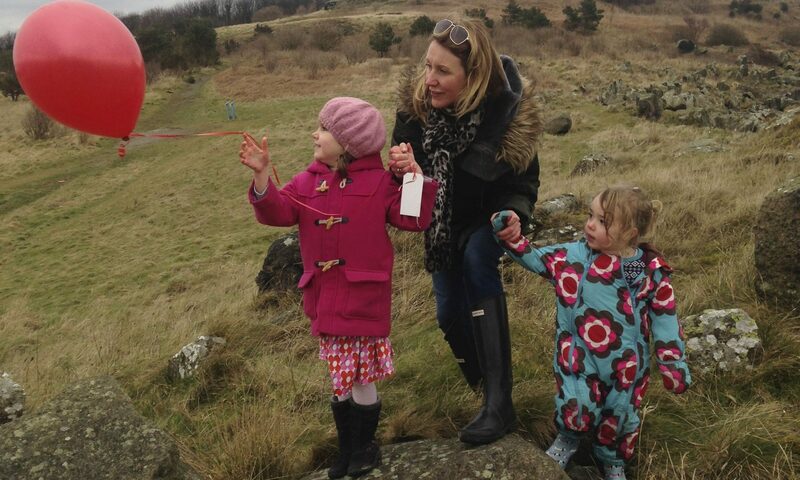 First up, Evie’s grand plan for walking up Daddy’s hill to raise money for a bench in Edinburgh. And we are nearly done! The girls are ecstatic and so chuffed that so many of the friends and family are helping them get there with the fundraising. Thank you everyone. Just less than £200 to go so any last donations are welcome – we are already thinking how we will word our plaque to thank you all. In the months after Colin’s death I could easily recount in minute detail by minute detail the few dreams I had of Col. The one where I was in our house, it was full of people, but I couldn’t find him. I desperately needed to speak to him. I hunted and hunted for my phone to see if I could track him on the phone. But no one had seen my phone. Eventually I found it. And it was blank. There was no key pad. I couldn’t dial his number to call him. I was devastated. I woke just missing his voice. Grief. Such a small word for such a bloody big never-ending process. It might rhyme with brief – it is anything but. I wish it were. Time heals…One of many stock phrases that get trotted out after a death. A simple combination of just two words that can make people like me, people who were just like everyone else in life until they suddenly aren’t because of death, feel like they are being given a mean old poke in the eye with a spiky spoke and a full-on extra nasty twist at the end of it. I can verify time does not heal you to the point of the fully restored ‘just how you were’ you. I am living proof of it. Time provides a distance between the trauma of a death to wherever you are in present time. In the immediate moment after death you are pretty much in the eye of the storm. Everything after is the process of grief. Time for me provides me time to numb, time to learn to cope a little better between triggers and as this process goes along I sense that the time between those godawful triggers, that have me sinking back into the darkness of grief once again, can lengthen. Time also gives me time to work my way through the emotional chaos created in the aftermath of each trigger and this time seems to get shorter each time. The bummer, a word I am borrowing from my six-year-old’s banned vocabulary list, actually let’s go further, the ‘total bummer’ is that it is my personal experience that time is yet to give me a heads up on where the triggers might lurk and sometimes time hoodwinks me into thinking I am properly healed (doh) and as strong as everyone told me I was along the way (another well-used stock phrase that people trot out to the bereaved when they seem to be less screaming banshee than they once were). My little girl loves to write. I find scraps of paper everywhere. I usually bin an awful lot. This one struck my heart as it explains her mindset this week and why I am getting so many questions about Col and what he was like. And even how he died. I will always answer honestly even if it breaks my heart.